Brown meat in Dutch oven or large deep skillet; drain. Return to pan. Add onions and garlic; cook 15 min., stirring occasionally. Drain. Spread meat mixture into single layer on parchment paper- or foil-covered rimmed baking sheets; freeze 1 hour or until firm. Break into chunks. 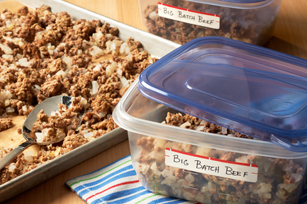 Spoon meal-sized portions into freezer-weight resealable plastic bags; seal bags. Freeze up to 3 months. Thaw before using as desired. Thaw in refrigerator overnight. Or, empty meat into microwaveable bowl and thaw in microwave.